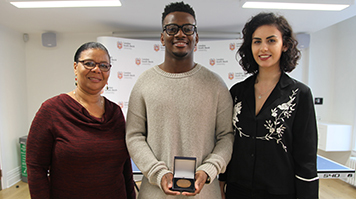 Elite Paralympic table-tennis athlete and LSBU sports student Ashley Facey-Thompson has been honoured for representing LSBU at the Rio Paralympics 2016, with a medal presented by Prof. David Phoenix, Vice-Chancellor of LSBU, at Caxton House. Ashley was presented with his medal in front of his proud mother, Pauline Facey-Thompson, and his girlfriend, Lucy Budworth, plus members of LSBU’s Sports coaching and mentoring team who helped give Ashley the necessary financial and moral support he needed to make it to the last Paralympic Games. Ashley also brought back LSBU's first medal in ten years from the Table Tennis National University Championships in November 2016, securing bronze in the men's singles. On receiving his medal, Ashley said: “LSBU contacted me but they didn’t tell me I would get a medal! I was really surprised!